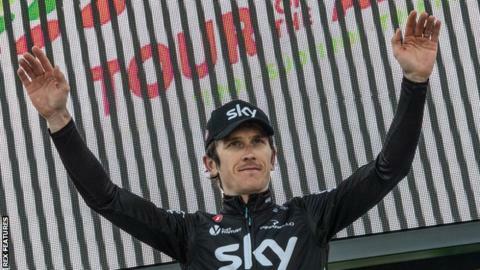 Welsh cyclist Geraint Thomas has won the Tour of the Alps, becoming the first British rider to do so. Team Sky's Thomas claimed the title by seven seconds after finishing third in the fifth and final stage. France's Thibaut Pinot, who won Friday's stage, finished second overall with Domenico Pozzovivo of Italy third. Thomas, who came into the final stage with a 13-second lead on Pinot overall, held on despite numerous attacks, winning his first stage race of 2017. The Tour of the Alps was first contested in 1962, although it was known as the Giro del Trentino until being renamed for this year's event.